Wall Street gave President Trump's first speech to Congress a standing ovation. 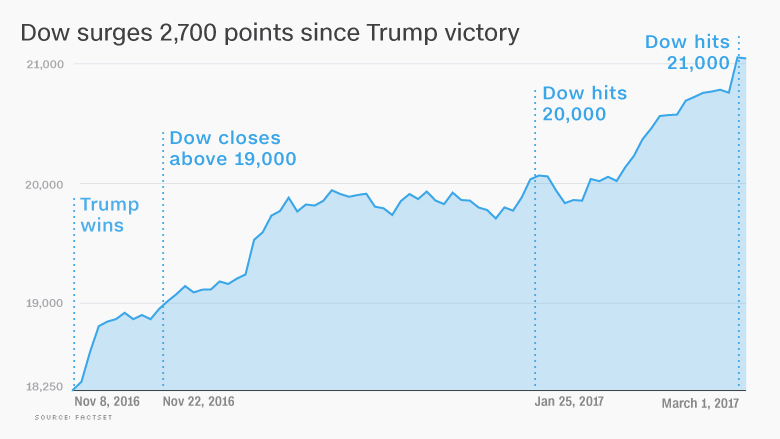 The Dow soared 303 points to close above 21,000 for the first time ever on Wednesday. The milestone comes barely a month after the Dow hit 20,000 for the first time. Trump's prime time address to Congress on Tuesday received high marks from viewers, and has clearly left Wall Street in good spirits, too. The Dow generated its biggest point gain since November 7, a rally that came after the FBI cleared Hillary Clinton in the email investigation. It's not that the speech gave investors the policy details they were seeking. If anything, Trump gave fewer specifics on major issues like tax reform, Obamacare and deregulation than many expected. The key for Wall Street was the tone of Trump's speech: He sounded a lot more optimistic and presidential than in previous speeches. "The speech didn't break any new ground, but it was much more orderly and methodical than we are used to hearing," said Nicholas Colas, chief market strategist at brokerage firm ConvergEx. "It was a solid speech from the perspective of putting Trump on a truly presidential footing," Colas said. For instance, Trump asked members of Congress to "join me in dreaming big, and bold and daring things for our country." That's a welcome shift given the turbulent start to Trump's term that has mired the administration in controversy. Chris Krueger, a Cowen & Co. analyst, summed the speech up this way: "Bigly delivery, more optimism, less detail." All told, the Dow has now skyrocketed 2,700 points since Trump's victory in November. It only took 24 trading days for the Dow to go from 20,000 to 21,000. That ties a record set in 1999 for the shortest period between 1000-point milestones, according to Ryan Detrick of LPL Financial. Of course, that late 1990s rally took place from lower levels, making it more impressive on a percentage basis. It also occurred during what turned out to be the height of the dotcom bubble that imploded soon afterwards. Bank stocks have been among the biggest winners of the Trump rally, and that was true again Wednesday as the S&P financial sector rose to its highest level since the Great Recession began in late 2007. But the latest bank surge didn't appear to be linked directly to Trump's speech, which didn't mention anything about efforts rip up the Dodd-Frank Wall Street reform law. Instead, big banks like Bank of America (BAC) and Citigroup (C) jumped 3% apiece thanks to increased confidence that the Federal Reserve will raise interest rates this month. That would be good news for banks, because ultra-low rates make it difficult for them to make money. Hopes for a rate hike were on the rise after New York Fed President Bill Dudley told CNN's Richard Quest that the case for raising rates is now "a lot more compelling." "There's no question that animal spirits have been unleashed a bit post the election," Dudley said. The question is whether animal spirits have now carried stocks beyond what's justified. After all, most of Trump's promised policy changes have yet to get through Congress, let alone take effect. That's why some investors worry that stocks are now expensive. Even before this week's rally, the S&P 500 was trading at 17.7 times its projected earnings for the next 12 months, according to FactSet. That's this valuation metric's highest level since May 2004, FactSet said. "The rally has gone beyond fundamentals, with valuations at extremely high levels by historical standards," said Brad McMillan, chief investment officer for Commonwealth Financial Network. 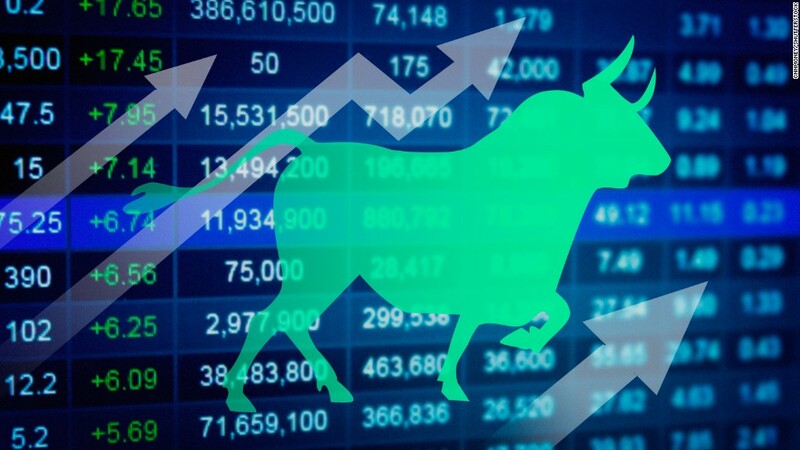 Bank of America Merrill Lynch put out a note on Wednesday warning that there is a greater chance "we are entering the typical later stages of a bull market." While BofA predicted stocks will end the year a bit higher than current levels, the bank predicted the "road could get bumpy as we head into the spring and summer months" as more details on tax cuts emerge.